A post about bus stops, you might wonder? Yes, this is a post about bus stops. Haha! 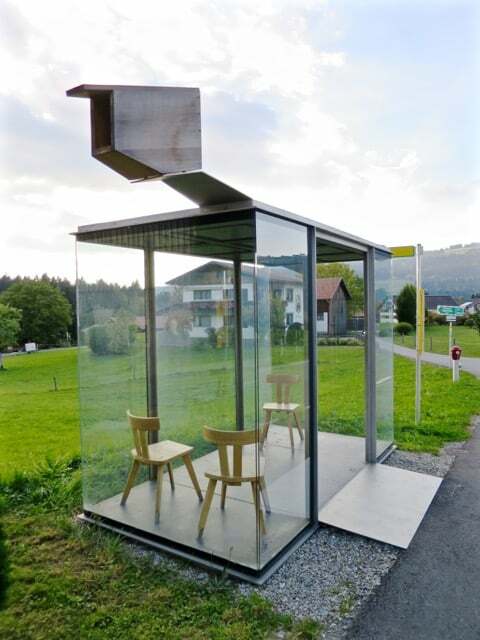 🙂 Not any old bus stop, but instead a cool collection of bus stops in the Austrian village of Krumbach (map). 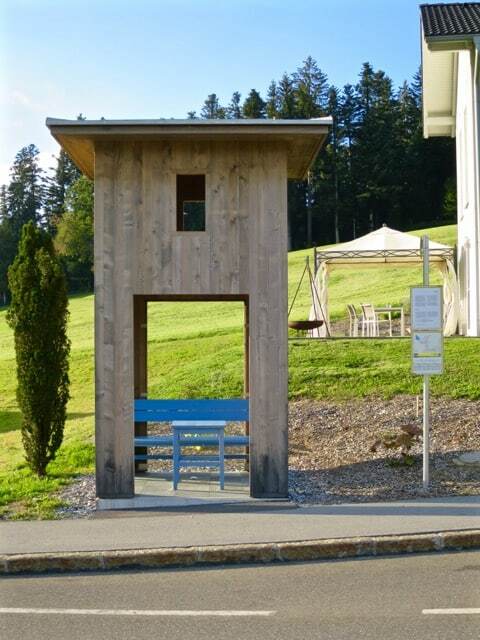 Being a fan of architecture and design, my curiosity was piqued when I heard of these designer bus stops in this Alpine village in the Bregenzerwald region of western Austria. 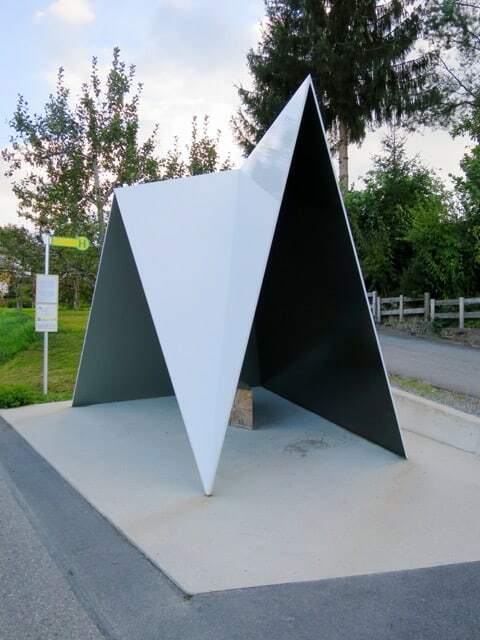 In 2014, seven architects from around the world were invited to design a series of bus stops in Krumbach, renowned as a village of award-winning architecture, that would reflect the traditional materials, craftsmanship and landscapes of the region. The result is quite astonishing and is in its own right a cool new attraction in the village. There are seven bus stops in total, designed by architects from Belgium, Spain, Japan, Russia, Norway, Chile and China. Each design is unique and evokes a different reaction from passers-by. This was one of my favourites, with the gorgeous view through the open window. This one has a double-purpose: a bus stop facing the road and a spectator stand (accessible via the stairs) facing the tennis courts! Along the way, you’ll pass green hills, orchards and forests. Love the blue table and bench in this bus stop! This one is in origami-style. Another cool one: a glass cubicle and some chairs. This bus stop, made 100% of wood offers a lovely view as well. 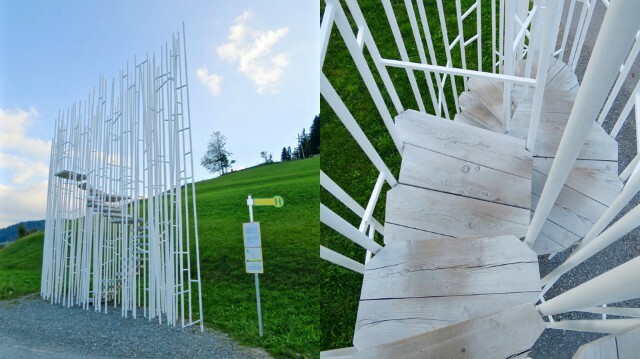 This is perhaps my favourite as it invites you to climb its staircase to enjoy the view! And this is the view from the little platform! We did this tour the quick-and-easy way (i.e. with a car) but you can easily hike from one bus stop to the other and slowly enjoy the gorgeous houses and stunning Alpine landscapes in Krumbach. I also recommend the occasional stop at one of the village’s pubs along the way! Visit the Bregenzerwald Tourism website for more information or my post on slow travel in Vorarlberg. Note: my trip to Bregenzerwald was part of the #AustrianTime blog trip, a collaboration between the Austria National Tourism Board and iambassador. As always, all views expressed above are mine, and mine only. These are insane. Great post! Yes, these bus stops are worth writing about! Hiking from one of these bus stops to the next sounds like the best idea – with a pub break (or two) in between :-). I know right! They’re so cool! Yeah, I know what you mean. Compared to the bus stops I grew up with, these look like luxury lounges! Haha! And almost every bus stop near where i grew up had graffiti, smashed windows (if there were any glass ones) etc. Nothing like those!